A bit of a different blog post starting today, a living journal. I really belive that Microsoft Windows strangle hold on the personal and corporate OS market is under significant threat. As I have detailed before, any endpoint from anywhere, zero and thin client is the future and is starting now. Majority of corporate applications except Sharepoint and Exchange (and who needs those with Gmail and Google Apps) runs on Linux, end users want to use Macs, Linux, mobile OS like iOS, Android, Palm OS and Blackberry. Tablet PC's are great for certain use cases (presentations, video, ebooks, mindmapping) and Chrome OS will be the game changer that takes away Microsoft Windows 7 massive market share. Finally virtualization means that even if you can't live without Windows for 5% of tasks and hardware, run Chrome or Ubuntu and run Windows in Virtualbox / VMWare or vise versa - corporations can easily deploy these types of builds to zero client and thin client endpoints. So in preparation for Chrome OS, I am going to run without Windows for 2 weeks and journal my progress here. Follow along with your RSS reader so you can check updates on the train on your mobile. Please add your own experiences or advice as comments or links to your journal or blogs. I will be running Ubuntu as my primary OS, off-line Google APPS for office replacement, Chrome as browser (my main on Windows anyway) and everything else is on the Internet. I am using a Dell Alienware M11x Laptop, 8MB broadband connection, I have a Samsung network printer (should be no problem) and a Cannon scanner, a few digital cameras and a few other USB devices. I am currently writing the requirements for my new iPhone and Android APP (simple security risk assessment) so using documents and spreadsheets and Mockingbird extensively as well as blogging, Gmail, Facebook, Twitter etc. In about a week I will be starting a new project with a major credit card company so I will see what it is like when I'm working without Windows also (although they may provide me a endpoint I will be pushing to use my own laptop, even just for remote access). 26/07/10 - Day 1 - Started project. So far so good, Ubuntu up and running. All hardware devices working, I can print and scan, Google apps for office Chrome works fine for my browsing needs. This blog entry written on Ubuntu with Chrome. iTunes for Linux installed and my iPhone 4 syncs fine to my backed-up library. I'm really impressed with the Google Chrome security video . Wish I could get my hands on a beta. Using Google apps instead of Office 2010 to work on my requirements doc, have a spreadsheet model of my application excel in another tab. All the basics are done well but some convenience features like merge cells in a table and resize columns with drag and drop, select a series of cells in joining columns without selecting all rows are missing. Can't copy paste easily from a spreadsheet to a document table either. It generally does reduce productivity at the moment (estimate about 20%) but it is not unworkable. Printing from Google apps means downloading a PDF and opening it and printing it - I can live with that. I love how easy it is to share the work though - so much easier to add users by email address than worry about password protecting and then emailing the doc, version management is heaps easier also. Who needs sharepoint? 27/07/10 - Day 2 - Starting day two, I'm going to give up gmail and google apps today and try the native Ubuntu email APP and open office. It's amazing but two years ago I would never have done this simply because it was inconvenient, now with cloud storage with dropbox, google Chrome sync and the iPhone showing me that the OS is really now a commodity and all I need is a few offline apps and a browser it is a simple jump to abandon Windows. I tell you, the days of Microsoft cash cows are numbered, especially if the new major endpoint manufacturers (Dell, HP, Acer) move to Chrome, Ubuntu or in HP's case PalmOS. There is even now cloud gaming using Virtual Desktop Technology (VDI) and why not! Email works well, really easy to setup, I love the fact that I can import a certificate and pgp natively without needing to install the PGP application. 28/07/10 - Day 3 - Loving the integrated chat and social networking built-in into Ubuntu, except my Facebook doesn't work :( trying forums now apparently something to do with the timeout. Good old forums, now facebook broadcast and chat works fine. Got my Chrome extensions installed now feels just like home. 29/07/10 - Day 4 - Another bug/annoyance found in Ubuntu - the integrated chat accounts set themselves to offline after reboot. Looking for fix now in forums. I think I'm quite happy now I can live without Windows, although maybe with a VM Windows instance for some things. I really want to get Chrome working, I see that there is a compilable version, going to have to give it a go. Has anyone done this? The more I use Ubuntu the more I notice it's lack of commercial polish, and to be honest I wouldn't mind paying for it if it mean that it did have that polish. Examples include: the chat account and IM account things I mentioned above, Google chrome flash player did not install properly, there is no GUI run as admin option. More and more I find a issue, I google it, find a forum page that fixes it, then I have to launch Terminal and copy past e the commands to fix it. I can think of a lot of users who say get Ubuntu pre-installed on their new Dell that would struggle to do that and at the first problem go back to what they know which is Windows. If Google are serious at making a run at the Windows desktop empire to understand their audience and make it as easy as possible - the command line should never be required and things should just work. I think they understood this with the options menu in Chrome browser hopefully they do the same with the OS. 30/07/10 - Day 5 - Ok I'm sorry I cheated because I really want to finish the requirements for my new APP and used Office in the Windows instance. Especially with Office 2010 I am just so much faster with it than with Google APPS. I really think until they make it a rich client or at least cache locally I'm always going to prefer office. I felt real bad about cheating with Office also, so I'm now trying OpenOffice. So far so good, it recognized the styles in the doc and the formatting looks retained. Nope there it goes, my table is completely screwed, maybe it would be fine if you started in Google APPS or OpenOffice but converting is still immature. Back to MS Office with me. BTW I love different workspaces in Ubuntu. 01/08/10 - Day 7 - Didn't do much on the computer today, no answer to my Chrome query on the forums so not going much further with that. May try again next weekend starting from scratch, may use a second laptop hard drive to do it natively without a VM. 02/08/10 - Day 8 - Started my new project today. A lot of just getting access sorted out so not doing much on Ubuntu other than stuff I was doing at home. Polished off my requirements (still cheating and using Word), posted my project on the free lance developer forums getting a fair bit of interest which is good. 03/08/10 - Day 9 - Ok this company won't let me use my personal laptop or do any work on there including non sensitive stuff so not going to get a real good feel for using Ubuntu in the workplace. I will just leave it open on dropbxo, skype, etc. I am using it to do some blogging and reading RSS feeds on the train journeys and brilliant so far. 04/08/10 - Day 10 - Used Ubuntu all day yesterday just for browsing, igmarkets portfolio watching, catching, updating blog. Brilliant not missing Windows at all. Its weird this company won't let me install Chrome, or even use it from a read only USB but they will give me VMWare workstation and allow me to install Ubuntu onto that, go figure.... more to come on working with Ubuntu soon. So what did I learn from this? I can live without Windows, Ubuntu is a perfectly fine platform for my everyday and work needs - if a little unpolished. The real things I missed are Microsoft Office (Open Office and Google docs just don't cut it yet) and for gaming, unless cloud gaming takes off it is a showstopper if your favourite PC game does not run on a non Windows platform, also hardware support/optimization for cards. could be done. If they manage to get one or two of the big OEM's on board like HP or Dell, optimize the firmware as the propose then it should be great. I still can't see how they are going to get around games and applications written for Windows only, an easy port option? A built in Virtual box type setup where you can install Windows games and apps? Anyways looking forward to seeing how it all unfolds, if you got this far thanks for following and for reading. Please share your experiences with Ubuntu and Chrome in the comments. 14/8/10 - Ok I have discovered flow: http://chromeos.hexxeh.net . It is a built image of Chrome OS that I can simply write to USB and boot from. So restarting this live journal and will blog my experiences with it. I have a brand new 500GB Seagate Momentus XT hybrid drive to test it on, so no more virtual machines I am going whole hog. 15/8/10 - No Philips head screw driver to swap the hard drive on my M11x. So have to look at the VMWare instance. First impressions - ridiculously fast boot even on VMWare. As soon as I hit start and open the console there is a blue image asking for a username and password. Enter that and you have a Chrome browser as promised on the net. It is a very APP like menu and really why do you need anything more? Everything that works in a browser (Gmail etc) works exactly like it does Chrome everywhere and I guess that is the best thing about it. How is offline mode going to work? I.e. can I use Google docs to work on a spreadsheet or document when I don't have internet access? How is it going to ever play a game like Starcraft 2? Will it rely completely on Cloud gaming services? How will hardware support work? I know HP was looking at email to print, would you need something similar for scanners, web cams, mice etc or are these expected to be supported by the OS? Seems like hardware will be supported, in the video the presenters plug in a camera, it is automatically detected and you can access the storage in a panel. You can easily launch files from this and copy to Google storage. I really love the idea of everything being stored in the Cloud and available from everywhere with a browser and an internet connection. Chrome OS has the Ubuntu multiple workspaces option. That is really cool, I really hope they take the Firefox tab magic to help organize and visualize these. 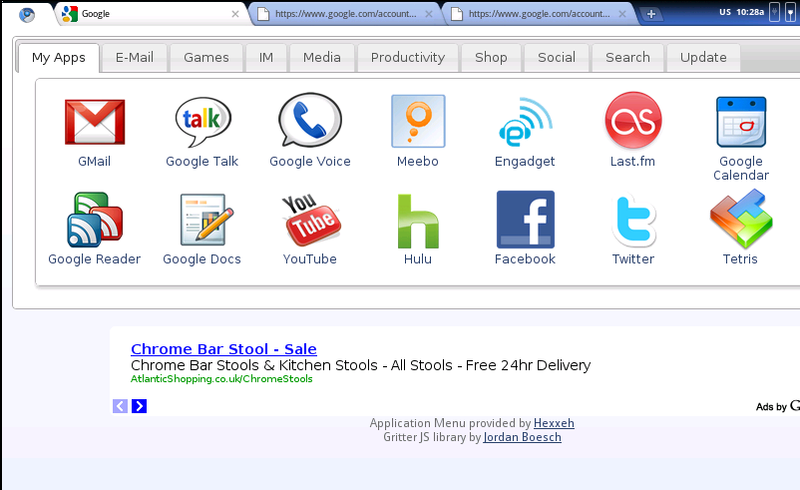 I like the APP tabs in the browser (these are small persistant tabs that allow quick access to your favourite web apps). Already when I start Chrome I instantly open my four or five favourite apps: Gmail, Facebook, Twitter, Quora, Blogger. Like the panels, just like the IM and social clients in Ubuntu and the Facebook and Google chat Windows, it is really intuitive and perfect for small apps like chat, calculator etc. In fact extensions work for this purpose as well: e.g. on Chrome browser currently I use mini Google maps, calculator, Football scores etc. Ok maybe I can work with this now. Let me get it on my new HD and see how I go using it day to day. Did get it working booting from a USB drive though. Works fine with Ethernet but my broadcom wireless drivers are not being picked up. And for the life of me I can't work out where the update hardware driver menu option is or even if there is a driver. With the actual version of Chrome expected to be published in a few weeks I wonder how they are going to work out these hardware issues. Oh well off to the forums and Twitter with me. 20/08/10: Been using the office.live.com cloud based Office service and it is brilliant. Still not full Office rich client support but very good and much better than Google documents and Open office currently. Wow a proper reply I was giving up on these forums. The idea as I understand it is to have programs like Google docs to have a web app [e.g. static local html5 web app page] that will allow you to edit offline. Content will sync once you get connected to the net. I love the idea of everything you do automatically being synced to the could and available everywhere. I haven't really used that in anger yet but could be good. > completely on Cloud gaming services? Unless the performance is comparable this is not really an option, but they again maybe this OS is purely for people that do not play rich client games but rather Farmville etc. You don't seem to have read up on it at all. It's a cloud-based operating system that's launching on netbooks. The goal is to provide users with a simple, fast, virus-free way to get online and use the internet. Google Chrome OS is a motorbike. If you want a car, buy a car. Don't really agree with that, it is the company party line with Chrome but if Google really wants to start taking some marketshare away from Microsoft it needs to address some issues like rich client gaming. Don't know about you but if I'm going to pay a lot of money for a personal endpoint which is a netbook form factor then I want to be able to do what I want on it and not be limited by the OS. For me (and I would argue many others) part of that involves being able to play a game or use all my apps with great performance not connected to the internet. If I can't do that with Chrome then I will stick to Ubuntu or Windows 7 or Mac OS X and ChromeOS will die like Wave. I dont need Chrome OS and a £300 netbook running it to have "a simple, fast, virus-free way to get online and use the internet". I can already do this perfectly well with my iPhone and iPad. The netbook/notebook form factor only makes sense if I can do more on it than what I can smaller more speicalized form factors like smart phones and tablets. 25/08/10 - Even with the brand new hard drive and trying it on a different older laptop (Dell Inspiron 1525) could not get the vanilla Chrome to transfer from the USB image to the hard drive using the DD command in Ubuntu and boot. It just fails at boot. Flash seems to work fine - I am running my second computer at work with Bloomberg TV and IG markets in the background and its great. Also, Windows users: to actually turn side tabs on, you'll need to right-click on a tab and then select "use side tabs" from the menu that appears. Do the same to turn them off again. It resonates with me fairly strongly and I've thought the same for some time now. I'm sitting here with a big smile on my face. Like many other people around the world you've discovered the joys of a non MS world. For most IT savvy people that is Linux, for some it's OSX and for others, as you point out, it's just moving away from the windows browser and you're done. Getting away from Windows and experimenting with other things is a ton of fun and an incredible learning experience, however, it's a certain type of person for who it is fun and who wants to learn about IT. The issue with Microsoft, is not that you can't do what they do another way, the truth is all of these things that you mention have been around for a long time, people like myself would argue that Linux has been able to do everything Windows can and better for many years, when was the last time you heard of a power grid running on windows? or a traffic light system? A hospital emergency network? The issue is that a surprising amount of people simply don't want to learn anything new or different relating to IT, as for them it is simply a means to an end. Even though their means isn't the most efficient, reliable, elegant, fastest or in all ways simply inferior, it is a way that they know, and they refuse to learn something new because it simply isn't a priority, which is fair enough. Also, while the change in interface from Windows to say Gnome under linux is not very hard, for some it throws up legitimate challenges. Small things like having the close window, maximize / minimize window in a different corner is enough to be problematic. It doesn't matter that they can change it to how they like, they don't know how and the unfamiliarity is something that makes it hard for them. I was really surprised to find that IE still has the market share it does, i guess most people really don't care, as long as it runs farmville am i right? I will be very very interested to see how Chrome OS goes, although i still haven't evened used an android phone. I installed linux on the ps3 when they came out just because you could. was yellowdog i think, interface was everything you would need and i could tell it wouldn't take much tinkering to figure it out. But the only OS that i would really have an option of changing to would be OSX and even then i believe i remember reading that Steam worked faster using the windows version through virtual machine software. At the end of the day i wouldn't move from windows 7 until i know my games and video drivers are optimized in that certain OS. As far as work laptop goes with no fear of drop frame rates for games or whatever, i would gladly embrace learning another OS. When you trial Chrome for me i guess i'll be finding out if i'll jump ship or not. You are right about gaming and hardware support. Although I would be suprised if ATI and Nvidia did not have reference drivers for Ubuntu these days. Have you also tried Cloud gaming? Nvidia and ATI have had optimized drivers for linux for many many years. That's not the issue though, the bigger problem is the nature of GUI's under linux, the division between the X server and the window manager. It's the massive amount of options that has prevented a standardized environment and consequently seen almost no game support (yeah I know there are a lot of games for linux but there are not many commercial ones compared to windows are there? ).